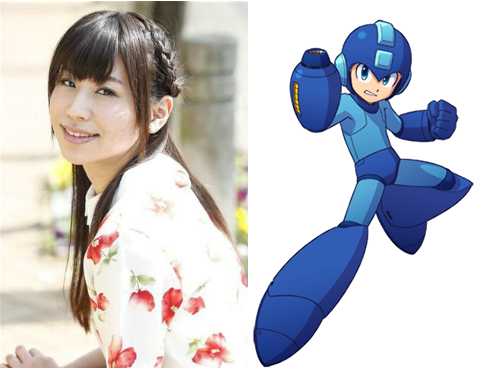 Confirmed by the official PlayStation blog and 4Gamer, Japanese voice actor Ayaka Fukuhara is the new voice behind Rockman in Rockman 11. Fukuhara is known for her various roles in anime – Rin Shibuya in The Idolmaster Cinderella Girls and Grea in Rage of Bahamut: Manaria Friends, to name a few – and Najd in King of Fighters XIV. You can hear her rendition of Rockman in the previously released Rockman 11 story trailer. Additionally, Tasuku Hatanaka has been announced as the voice actor for Blast Man. He is known for his work on Yu-Gi-Oh! Zexal as Yuma, My Hero Academia (Denki Kaminari), and Kabaneri of the Iron Fortress (Ikoma). At the time of this writing, the English voice cast for Mega Man 11 has yet to be announced. We do have some ideas who is who but nothing's official yet. More news on this front soon! My favorite Japanese VAs for the Mega Man cast were in Super Adventure Rockman. The VAs for the Upon a Star OVA were nice too. As for the English cast, I would be happy with something like the Powered Up cast. I'm not familiar with Fukuhara's work. Has she voiced young boys before? As for the English cast, all I can say for certain is that Ben Diskin is Mega Man and Keith Silverstein is Dr. Wily. She is relatively new to VA work. She started in 2012. Granted she is better than the western VA, who just sounds like a generic Saturday morning cartoon douchebag. To get the right vocal timbre and pitch for Mega Man, he should be voiced by A: a young boy, or B: a woman. Nothing wrong with that considering he's supposed to be like, 10-12 in age, right? Ben Disken, his assumed current actor, is a good VA, but it simply sounds like an older male doing a younger voice. It has to be believable, and his voice actor from Powered Up is also an older guy and did a great job in that regard. Besides, women voice actresses are great for that type of character. Brianne Siddall, Barbara Goodson, Mona Marshall, Laura Bailey, Tara Strong, the list goes on. Wow, you're calling Ben Diskin a generic Saturday morning cartoon douchebag? Look who's talking. I don’t care who the actor is and neither should you, if they are not right for the part what does it matter? It’s incongruent with the character. I’ll be turning the voices off or using the Japanese track. "I don’t care who the actor is and neither should you, if they are not right for the part what does it matter? It’s incongruent with the character. I’ll be turning the voices off or using the Japanese track." Ben Diskin has voiced young boys before in animation and the trailers so far hardly cover any actual full dialog in-game, so why are you getting your undies into such a bunch over it? I swear, the overreactions of some people online are just flat out hilarious. Folks like you need to grow up and stop acting like your opinions determine the fate of all games. I’ve seen whole levels of the game streamed and have heard enough of Mega, he won’t shut up in fact. And I’m hardly “getting my undies into a bunch”, simply voicing an opinion in the comment section. Since I don't want this to carry on, let me make one thing clear before I finish: telling me I shouldn't care who the actor is a bizarre thing to say. I do care who they choose, so I don't know where you got it in your head to tell me I shouldn't. You obviously don't know me, so you're in no position to tell me I shouldn't care. That's all. Good day to you. Meaning the best actor in the world can be terrible if they are not right for the part. The only thing bizarre about this whole exchange is how quickly you get offended and your rabbid defense of Mr. “Bill Diskin”. I’m not interested in wasting anymore of my time, good bye. The only thing that's bizarre here is how you declared you'll be switching to the Japanese voices, as if anyone here is supposed to care. There's nothing wrong with Mega Man being voiced by a woman, since he's a young boy. In fact, judging by the trailers, his Japanese voice here is way more fitting than his super deep voice in the English language trailer. I get that his voice was higher than usual in the localization for Mega Man 8, but that aside Mega Man's not supposed to have a deep voice at all. Sure, his name might be Mega "Man", but he's still a little boy. I'm actually still super disappointed in his localized voice that I'm sure came about because of how vocal people are about not wanting Mega Man to sound "too girly", and it's yet another addition in this dumb continuing trend of kid characters that sound like adults (see also: Dipper in Gravity Falls, and Huey, Dewey, and Louie in the new DuckTales). Ironically, I never hear people complain about Volnutt's localized voice, even though he's older and a slightly less high voice wouldn't be out of place with him. That being said, I do think the actress that did Volnutt's English voice was pretty nice. Anywho, sorry if I seem a bit abrasive, but kneejerk negative comments about a woman voicing Mega Man rub me the wrong way, especially when it's actually more fitting for a child character like him. Bart Simpson, Ash Ketchum, Miles "Tails" Prower, Ben Tennyson... these are all good examples of little boys being voiced by women that work well, and that's the kind of thing I wish we had with localized classic Mega Man, but I feel like the negativity that surrounds Mega Man 8 that's been elevated to meme status means we'll never have this. Nuuuuu, I want Azuma Kazuma-chan, wah! Ah, she's a fine choice. I just think it's neat that the Rockman Rockman VA was also the lovable, bread-baking goofball from one of my favorite Japanese cartoons, heh. It was kind of like when when I noticed that Nobuyuki Hiyama, the voice of Ocarina-era Link, was also Viral, in Gurren Lagaan. I really don't like MM's english voice actor in 11, he sounded a lot better in 8 IMO.